Haleiwa Joe’s is open to the public for dinner every evening, so intimate evening receptions following an afternoon ceremony is available on a limited basis. Please inquire with us directly regarding availability and specific details. The garden/chapel site fee is $1000.00 for 2 hours of exclusive use of the gardens- this is a requirement for all weddings. A hired Haiku Gardens Event Coordinator is required to have access to the Tahitian Chapel. Additional garden time is $200.00 per 1/2 hour. Overtime charges of $200.00 per 1/2 hour will apply if additional time is utilized other than the contracted time. Haleiwa Joe’s is open to the public for dinner every evening, so intimate evening receptions following an afternoon ceremony is available on a limited basis. Please inquire with us directly regarding availability and specific details. Seating for all dinner receptions will be made based on restaurant availability. Menu selections and counts for each entrée must be submitted two weeks prior to your event. Reception start times vary, based on the day of the week and your estimated guest count. General seating time is from either 4pm – 6pm or 4:30pm – 6:30pm, however this will be decided priorÂ to signing any contracts with Haiku Gardens. 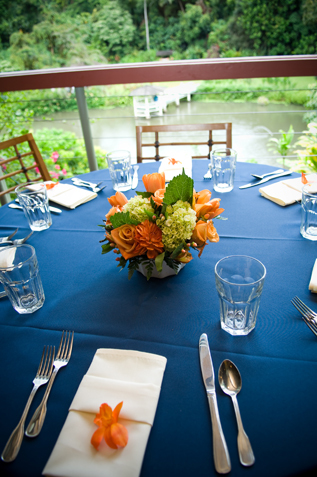 It is extremely important that your event starts on time for everything to run smoothly. 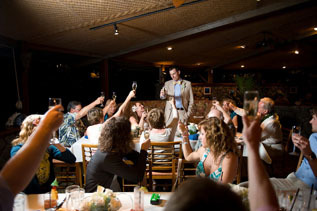 Haleiwa Joe’s reserves the right to set up your party in the best possible area and table configuration that is the most appropriate for you and our patrons. Requested areas will be noted, but may not be suitable or guaranteed. There are no private areas or rooms in the restaurant. Beverages: Hosting of non-alcoholic drinks is required. Absolutely no Cash and Carry. One check per table for alcohol is permitted. Hawaii sales tax of 4.712% will be added to all ceremony and reception costs, and an 18% gratuity will be added to all food and beverage costs. Haiku Gardens is not responsible for the removal and discarding of any decorations brought in from guests or outside vendors. A clean up fee of $150.00 will be due at the completion of the ceremony and/or reception if excessive trash is left behind. Your guest count is also due 30 days prior to your event. You may increase this count for 2 more weeks, however it may not be reduced after the 30 day deadline. Any remaining balance must be paid in full at time ofÂ increase. Lightly breaded & seasoned. Served with a Thai Dipping Sauce. *Applicable taxes and 18% gratuity will be added. Seasoned Hawaiian ahi & fresh vegetables rolled in a lumpia wrapper & deep fried. Served with a Thai dipping sauce. Each guest will have a choice of 3 selections. The Prime Rib dinner can be added to any menu for $37.95 or market price. Menu selections for each guest will be due 2 weeks prior to your event. The party’s host is responsible for soft drinks. Frozen non-alcoholics, juices & alcoholic beverages can be hosted, limited hosted or no host. Please let your coordinator know which you prefer. Fresh Island Fish Baked local fish, always fresh, only the best! Speeches, singing, or entertainment are strictly prohibited for evening functions. Haleiwa Joe’s does not have private areas or private rooms. The area and table set up for your party will be determined by Haleiwa Joe’s management. A gratuity of 18% is added to parties of 8 or more. Applicable taxes will be added. No separate checks. One check will be issued for entire party. A scoop of macadamia nut ice cream smothered with fresh fruits and topped with burnt caramel. A killer chocolate cake with hot cream cheese and chocolate filling and topped with raspberry sauce. Refreshing mango and raspberry sorbets. Kona coffee ice cream on a bed of Oreo Cookies, with Belgian bittersweet chocolate sauce whipped cream and toasted almonds. Coconut ice cream and banana lumpia drizzled with Belgian chocolate sauce and sprinkled with peanuts.